The word or the Mantra Ram – राम is probably one of the most common of the Hindu Mantra Chants or Greetings- Ram-Ram –राम राम or Jai Shri Ram जय श्री राम. Most people take the word Ram for granted not realizing its importance in the elevation of the spiritual progress of an individual and taking him to the next level in the path of self-realization or Kundalini Awakening. Ram as we all know is the seventh Avatar of Vishnu and the Maryada Purushottam [the perfect human]. A large number of people practice the Ram Naam Japa daily for resolution of their mental and material problems and ultimately gain success in resolving their problems. There is a magic in the word Ram, even if you are not oriented towards traditional Hindu rituals or Mantra Chanting, just chanting Ram without any devotion will enable you to find the elusive mental peace you are desperately seeking. 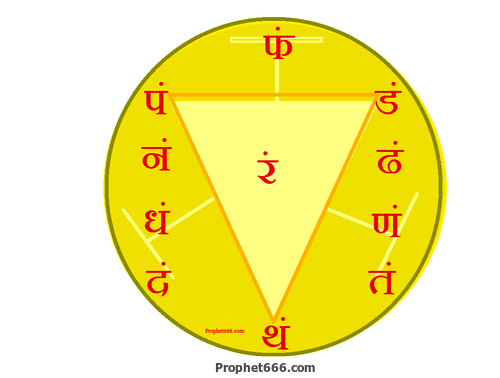 Ram is the root Mantra of the Third Chakra, which is the Manipura or Solar Plexus Chakra. It is the Charkra of motivation, drive and dynamism. This is that Chakra, which leads to the higher Anahata, Vishuddhi, Ajna and Sahasrara Chakras or the Heart, Throat, Third Eye and Crown Chakras. Ram is the symbol of the invincible warrior and warrior energy is one of the main attributes of the Manipur Chakra. Any blockage or malfunction of the Manipur Chakra affects the body parts located in the area around the Navel, Solar Plexus and the stomach region of the human body like the digestive organs, kidneys, intestines, liver and other such organs located in this region. This has an adverse impact on the digestive system giving rise to a host of stomach related ailments including excess gas, acidity, urinary tract problems and pain, excessive bleeding and irregularity of the monthly cycle. An imbalanced or blocked Manipur Chakra also affects the nervous system and leads to lack of drive, low and passive energy, passiveness, fear, helplessness, fatigue and lethargy. The Manipura Chakra is more often than not activated in advanced practitioners of the Occult and also those claiming to be aware of the Spirit World as the Manipura Chakra is the gateway to the higher Spiritual Levels. Meditating and chanting the Ram Mantra can surely aid in quickly stimulating the Manipur Chakra. While chanting Ram the practitioner will feel the circulation of energy in the Manipura Chakra, which lies slightly above the area of the body, which is behind the Navel. Please suggest remedies to me done during navratris to get rid of extreme body pains and money problems. nice... pls upload all chakra medetation how its work.. how to do step by step.. and everythik about chakra, i want to learn all chakra.. i searched all website and all pdf no one give any information about clearly.. human not experience of all things.. pls give more information..